Nearing the third State of the Nation address, research group IBON said that debt-driven growth under the Duterte administration is not resulting in substantial improvements in the Philippine economy. According to the group, while ballooning debt accelerated government spending and pushed the 6.8% economic growth during the past year, the agriculture and industry sectors, which are essential for jobs generation, increasing people’s incomes and stimulating economic activity, continued to deteriorate. The bloated debt is fast becoming an even greater burden now for Filipinos. With the Build, Build, Build infrastructure program underway, government spending leapt in terms of government final consumption expenditure from 0.1% to 13.6% growth from the first quarter of 2017 to the same period in 2018; and in terms of public construction from 2.1% to 25.1% growth, IBON observed. However, despite reportedly improved tax revenues due to the Tax Reform for Acceleration and Inclusion or TRAIN law, national government deficit grew rapidly from an equivalent of some 1.6% of gross domestic product (GDP) in the 2011-2016 period, to 3.9% in the first quarter of 2018. 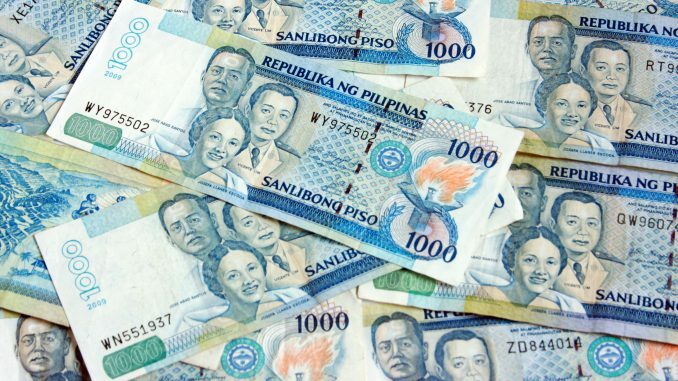 Meanwhile, government has announced that gross borrowing, which grew from Php507 billion in 2016 to Php986 billion in 2018, will reach Php1.9 trillion in 2019. This may have been a factor in the international credit worthiness watchdog Fitch’s affirmation of a stable outlook of the Philippine economy, IBON said. This burgeoning debt is alarming, said IBON, because not only does it create illusory growth; it also increases the Filipino’s debt burden without entailing real benefits for the people. Despite growth, agriculture’s contribution to GDP is now only at 8.5%, while manufacturing remains stagnant at 23.6% of GDP in 2017. At about the same time, total debt has grown to Php6.8 trillion in May 2018 from Php5.9 trillion at the start of the Duterte administration, or by Php885 billion. This is more than double the amount of debt incurred by the previous administration in over six years. Instead of spending on social and economic infrastructure such as irrigation facilities, hospitals, schools, and safe, accessible, affordable mass transport system, among others, which the people and the economy badly need, some 94% of government’s 75 flagship infrastructure projects are in fact mega railways, highways and airports that are highly profitable for the private sector or benefit business enclaves.